Heartwood » Blog Archive » Machine number two. And why. Machine number two. And why. To a woodworker tooling up a new shop or upgrading an established one, I suggest the second major machine acquisition should be a good quality bandsaw. Nope, not a table saw, not in the number two slot. True, the table saw rips and crosscuts very well but is far less versatile. A bandsaw will generally not rip as cleanly as a table saw, but with an excellent blade it does a surprisingly good job that is just a very few hand plane passes away from finished. For clean, accurate, consistent crosscutting, it must be conceded that the table saw is the clear winner. Still, the shooting board can take care of that issue. Nonetheless, if I had to give up one of these two machines, there is no doubt the table saw would go because the lack of a bandsaw would be far more limiting to my range of designs and work. The bandsaw also takes up much less shop space than a typical table saw. There is an additional, hard to define virtue of bandsawing. It is the machine work that I liken most to hand tool work. I feel in touch with the cutting action and in control of the work, unlike with the table saw where, after the setup for a cut, the machine essentially rules. A bandsaw is also way more just plain fun to use than a table saw, jointer, or planer. I would strongly suggest a steel frame saw in preference to a cast iron version. While a review of specific machines is beyond the scope of this post, I suggest to look for at least 10″ cutting height, preferably 12″ or more. Lower priced steel frame saws in the $800-900 range, such as the Rikon 10-325 or Grizzly G0457, are not more expensive than a quality cast iron model plus a riser block. Better still, move up to a Minimax or Agazzani. True, true. I think this one will vary significantly among woodworkers though. For me, a grinder for hollow grinding chisels and plane blades would be right up there on the list. Yea, one of these days I’ll discuss the Tormek. For this machine discussion, I was thinking what BIG machines and in what order. I just discovered your site and am enjoying reading through all your entries. You write well, and I appreciate your insights into the world of small shop craftsmen. I get a sense that you connect to the work of makers like Alan Peters and David Charlesworth. A couple of comments. Until just recently the Tormek grinder was causing me real fits when working with chisels. After using the straightedge jig the ends were never square, always skewed. I’m chagrined that it took me as long to figure out what was happening, but, as you may know, it has to do with the fact that the clamping bar, which gets tightened down with the two spring loaded knobs on either end, must be kept absolutely parallel to the main bar that slides on the rod. The bottom edge of the chisel registers off that upper bar, and with wide plane blades it maintains a parallel position, but with narrower chisels, it can easily rock to one side a bit and if you tighten the bar just slightly less than parallel, you’re in for trouble. If the product literature had pointed that out, I could have been saved a serious amount of frustration and about 1/4″ of wear on the stone! But now it’s working fine. I like your design of the shooting board, and notice that you run it in line with the length of the bench, as opposed to ninety degrees, which you normally see. It solves the problem of tightening/clamping down the far end of the board. It also puts your body in a different relation to the tool, making you lean a little. Has that worked for you? Have you tried both ways? Thanks for the comments. As have so many woodworkers, I’ve learned a lot from the writings of those two gentlemen. 1 – When a chisel is clamped into the SVH-60 Tormek jig, its top (beveled side) gets pushed onto the base of the jig. However, we judge parallel results relative to the back of the chisel. If the chisel’s top and back planes are out of parallel, such as with some handmade Japanese chisels, the grind will be out of parallel, unless a compensation is made. 2 – The Tormek bar can flex. But here is a direct approach to this issue: If I am starting with a square bevel, I blacken it with a wide marker pen before clamping it in the jig. Then grind in the middle of the bevel for a few seconds. If the resulting grinding mark is made evenly across the bevel, keep going because the finished grind will be parallel to the original, ie square. If not, adjust, etc. This principle is a handy way to duplicate grinds on skewed bevels. I feel more at ease with the shooting board along the length of the bench. I can keep my left leg stepped forward as I work which takes any strain off my lower back. I would find myself awkwardly reaching forward if the board was perpendicular to the bench. Furthermore, I like a long shooting board which allows its use for shooting fairly lengthy long grain edges. By the way, I’d probably make the board’s platform 8″ wide if I were to make a new one. I hope this is helpful information. Thanks again for your comments. And of course: happy woodworking! Thanks for the link to the Tallow Tree jig. It looks really good. I use the Tormek truing tool and experience that it does leave a less than desirable surface. I wonder if you have used the Norton flattening stone. When I work on a Japanese water stone, I wedge it into a nice wooden base and, to flatten, remove it and true it on wet/dry on a piece of glass. It would be advantageous to keep it in the base, run a flattening stone over it, and not have the wet pieces of paper to deal with. A small difference, but those little simplifications add up! 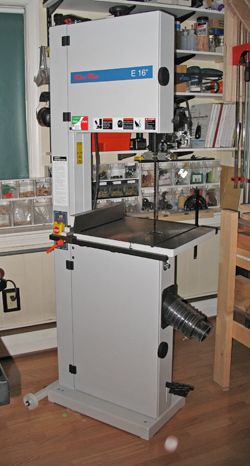 I have an old Rockwell 20″ bandsaw which I bought re-conditioned from Rudolph Bass in New Jersey twenty five years ago. The guide post has always been bent, slightly, cocking it at an angle which requires everything to be adjusted with each height change. Wow, it’s become a Zen practice. It is a solid old machine, painted battleship gray, and has done its share of service, but, boy, am I ready for a shiny new one! I think about retrofiting Carter equipment on it and then I visit someplace, as I did recently at Woodshop Specialties in Rutland, Vermont, that sells new Powematic equipment already fitted out with those new Carter guides, easy access to the guides under the table, everything balanced and quiet, good dust collection, and I say, naw, time for a new saw, because not only does the bandsaw do all the things you outlined, but it is a pleasure to use. I use Shapton stones and the Shapton Glass Diamond Lapping Plate. Yes, the latter is big bucks but it works great. The Norton system is a very good, low cost system. Their flattening plate is only about $30 and would be much more convenient, as you suggest, than wet/dry paper, and, over time, would save money. If you’re referring to the Powermatic 1791216K, that is about $1200. That’s in the lower range of steel frame saws such as some Grizzly models and Steel City. You can get a Rikon 10-325 for about $850. The Popular Woodworking folks liked it. If you’ve got more dough, consider a Minimax or Agazzani. Good luck. Did you give consideration to Laguna bandsaws while you were shopping for a new one? What appeals to me is the fact that it utilizes the width of that cutting edge one has gone to such lengths to sharpen. Yes, I did consider Laguna bandsaws. That looks like a great design – I’ve eyed it for a while and have considered purchasing it or, more likely, building one like it -when I “get around to it”. In addition to spreading blade wear, it produces a shearing cut which ought to help. Thanks for pointing it out to readers! I love your blog. 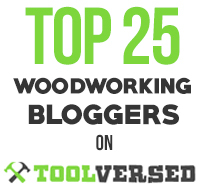 Your’s and the Woodworking Magazine blog are the only ones I read religiously. When I saw the first machine you picked, my initial reaction, was “What, how could he pick a planer over a jointer as the first tool” but read your explanation and I have to completely agree with you. Same with the bandsaw. I have all of these major tools now, but since I am trying to focus on mostly handtool use I could live without any of my major tools except for the planer and bandsaw (although I love my cyclone dust collector as well). Thanks for reading and for the comment. Hi, I found your articles extremely interesting, as I’m currently considering purchasing my first shop tools and have been weighing my options as I am a beginner, who has no experience, no training, and because of that, no idea what I’ll like or end up wanting most to do. However, It left me still not knowing where to go from here. As I stated above, I’m a beginner. So farr, my tools have been limited to the Walmart/Home-Depot variety of inexpensive Circular saw, Jigsaw, Router, and drill. My materials limited to soft pine and cedar lumber from the same. I refuse to resort to making bird-houses and key hangers, and I’ve already built about all the simple shelves and patio furnature I have room for. Of course I’d love to just run out and buy a shop full of 3-5 thousand dollar state of the art tools, but that’s just not my reality. Hell, I can’t bring myself to buy a nice set of clamps, when I can manage to make due with a couple of rusty old 4″ C-clamps. Spending $500-$1000 on my first real shop-tool is a very big deal for me. I need that investment to really pay-off! A situation like yours is just what I had hoped to help with my opinions on machine purchases. There is no single right answer. 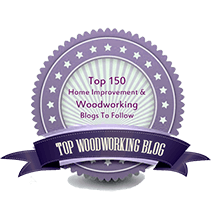 See http://www.finewoodworking.com in the Woodworking Life blog where I posted my thoughts and got lots of comments. Decide what you want to build and how you would like to work, then buy. My opinions are biased toward original-design furniture making. Good luck. I think after those first two machines the options become much more divergent based on the type of woodworking one is doing. For most furniture making, I would suggest a jointer, a router and router table, and a table saw. The table saw, while not the first machine to acquire, is a workhorse and can be used safely. The main thing is to decide what you want to build, then get the means to build it. « Which machine first? And why.